Time to set sail with Captain Jake and explore the seas of Neverland! Disney presents the newly promoted Captain Jake as he unites Never Land’s all-time greatest pirates in Captain Jake and the Never Land Pirates: The Great Never Sea Conquest! When evil mer-witch Ezmeralda tries to take over the Never Sea by awakening the Strake, a legendary three-headed sea serpent, Jake and his crew try to intervene but matters get even more complicated with the appearance of Lord Fathom and his sidekick Sinker. 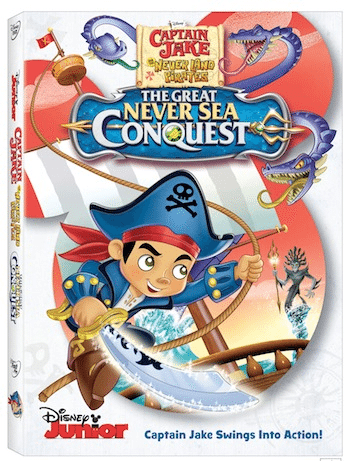 This adventure-filled DVD includes The Great Never Sea Conquest plus 6 additional episodes of the hit Disney Junior series; which is over two hours of swashbuckling fun! Plus FREE inside every DVD is an exclusive 3D Colossus puzzle ship you can’t get anywhere else! Available to Own on Disney DVD January 12th.